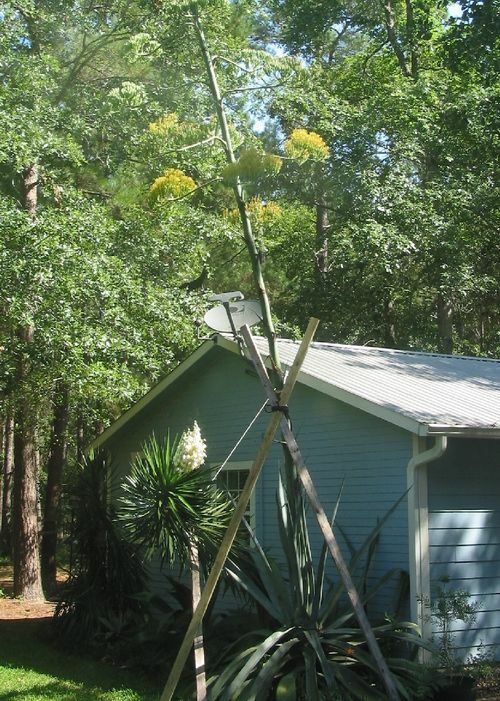 05/18/09 - Larry sent this photo, with the comment, "Here is another pic of the century plant and yucca. It is really quite noticeable that the century plant is starting to die." I don't know about you guys, but that last sentence really grabs me with a feeling of sadness. I've read it several times now, and I get the same pang every time. I am quite certain there is a deep philosophical thought there, and would appreciate hearing how some of you can put it into words. June 19 - Larry's comment about the imminent death of the century plant, "The death of the century plant is not sad for us. We had been thinking of digging it up because it is too large and so close to Priscilla and Charles' house. It must have heard us talking about it." To comment on this or any photo, follow the link at the top of the lead post.